IF it’s glitz and glamour you’re after, then Ayr Racecourse is the place to be on Saturday 9 August for the annual WaterAid Ladies Night. Firmly established as one of the major social events of the year in the west of Scotland, it’s also one of those nights when dressing up is the thing to do. Glamorous girls can land lucky, as if they are chosen as one of the best dressed ladies on the night, they win a silver coin which will be their passport to Ladies Day Final on Friday 19 September and the opportunity to win a fabulous prize. 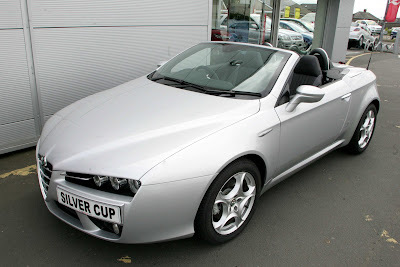 Top prize this year is a silver Alfa Romeo Spider 2.2 JTS convertible (pictured below) worth £25,000 courtesy of sponsors Kerr & Smith/Iveco Trucks suppliers of commercial vehicles in South West Scotland. The make and model of the car was only revealed in June after months of mystery as it was paraded around Ayrshire and Glasgow in a box on the back of an Iveco Stralis truck. Second prize is a £3,000 white gold Vivienne Westwood necklace and ear-rings set with diamonds and pearls and is provided by Oghams the Jewellers of Ayr and Edinburgh. And third prize is a seven night Ocean Village cruise for two plus flights courtesy of Stewart Travel of Prestwick. So how do ladies attending WaterAid Ladies Night get their hands on a silver coin? The answer is simple. Don your glad rags, best dress, hat etc and head to Ayr Racecourse. And if one of the panel of undercover judges decides you are worthy of a coin, you’ll be on your way to Ladies Day Final on 19 September. On that day there will be 27 ladies with coins, and each will draw a horse running in that afternoon’s John Smith’s Ayr Silver Cup. The holder of the winning horse lands the car, second the jewellery and third the cruise. WaterAid Ladies Night itself on 9 August is a very special night when around 7,000 people will create a unique atmosphere, with the racing commencing at 5.50pm and after the last race at 8.50pm, top dance band Counselled Out will take to the stage in the Ayrshire Suite for three hours of top entertainment. Ayr Racecourse marketing manager Lindsey Smith said: “Ladies Night is one of the best occasions of the year, not only at Ayr Racecourse, but anywhere on the social scene. There are great savings on tickets booked in advance. Go online at www.ayr-racecourse.co.uk or call 0870-8505666. There are currently 310 Ayrshire business stories permanently archived on this site. To locate those of most interest to you, please use the site search facility in the top left hand corner of this page. Type your search term in the white box, then click “SEARCH BLOG”.